We love exploding box cards as evidenced by our fascination with Helen Griffin’s Simply Made Cards exploding box die. But to be honest, exploding box cards can look a bit intimidating to create. They require precise measurements and a handful of scoring lines, but don’t be discouraged! We’ve simplified this process making it as painless as possible. 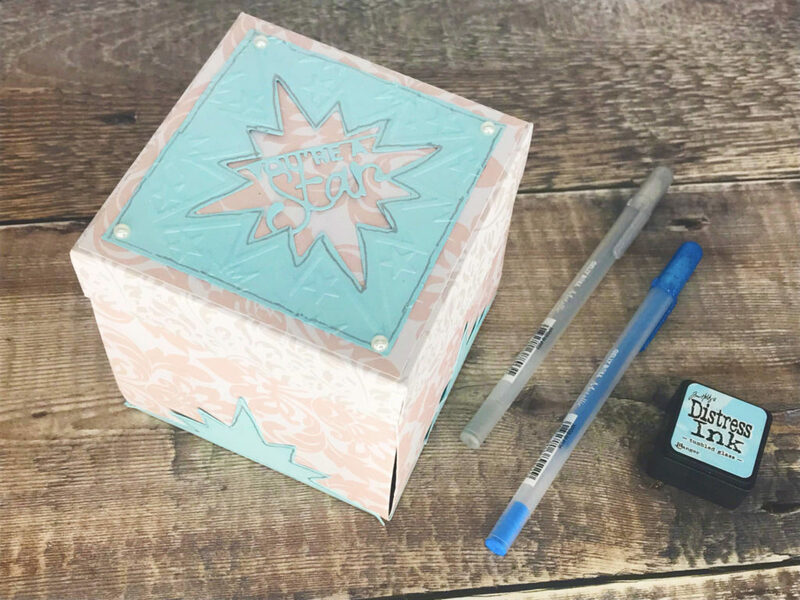 Read on for how to create an easy exploding box card. Plus, there’s a video tutorial with step-by-step instructions below. Making this sort of dimensional project is all about using papers and toppers that coordinate. 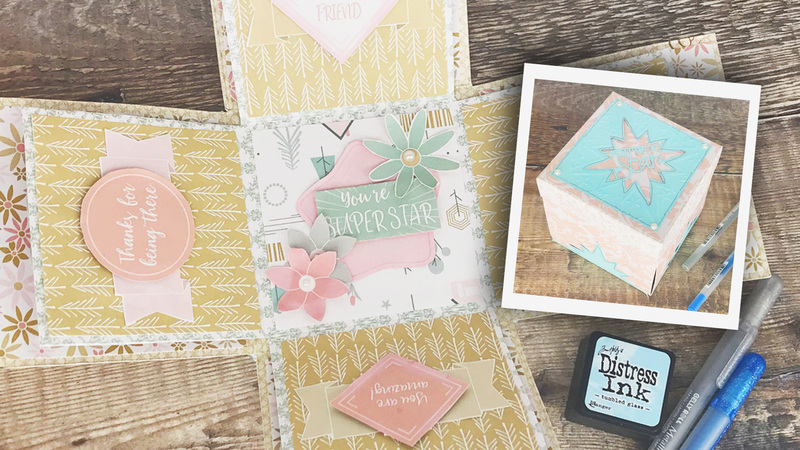 We used 12×12 scrapbook paper to create our base, but we embellished the inside of our exploding box card with the latest Tonic Studios Cardmaking Collection Kit (issue 7). Start with 2 pieces of 12×12 scrapbook paper. Score 1st piece at every 4 inches (scored at 4in. and 8in. ), rotate then score again at every 4 inches. It will resemble a tic-tac-toe game. Cut out the 4 corner pieces with either scissors, trimmer, or craft knife. (Once trimmed, it will resemble a cross-shape). Trim your 2nd piece of scrapbook paper to 10.5in. x 10.5in. and score at ever 3.5 inches, rotate then score again at every 3.5 inches. (scored at 3.5in. & 7in.) Again this will resemble a tic-tac-toe game. Cut out the 4 corner pieces with either a trimmer, scissors, or a craft knife (this will resemble a cross-shape once trimmed). Burnish your score lines and layer and glue the 2 cross shapes together at the centre. Trim a piece of scrapbook paper to a 6 1/16th inch square. Or a square that measures 6 inches and a hair! Glue the tabs to form lid. Make sure the tabs are glued on the inside to give you a nice smooth finish on the outside of your lid. Next, create your mats. For the inside of the box base the mats measure 3.75 in. x 3.75in. The inner box mats measure 3.25 in. x 3.25 in. Decorate the inside with mats, toppers, and dies included in the kit, plus stamps and pearls! The colours and patterns coordinate so nicely. Buy your Tonic Studios Cardmaking Collection Kit 7 at Craftstash! *This tutorial has been inspired by Cherry on Top blog.